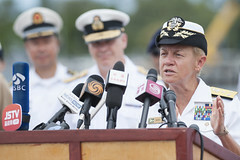 Adm. Scott Swift and Vice Adm. Nora Tyson emphasized the the importance of exercise Rim of the Pacific during an opening press conference at Pearl Harbor, July 5. The mine countermeasures ship arrived in Osaka, Japan, July 6 for a port visit as part of a summer patrol in the U.S. 7th Fleet area of operations. 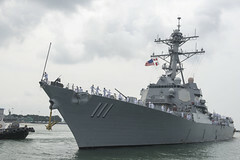 The guided-missile destroyers USS Decatur (DDG 73), USS Momsen (DDG 92) and USS Spruance (DDG 111) arrived in Singapore July 2 for a port visit. 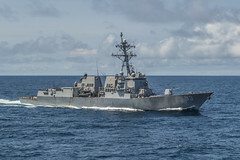 USS Patriot (MCM 7) departed Sasebo, Japan, July 2 for a routine patrol in U.S. 7th Fleet area of operations. 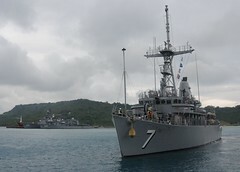 The amphibious dock landing ship completed a multi-day transit of the South China Sea July 1 as the ship continues to operate in the U.S. 7th Fleet area of operations. 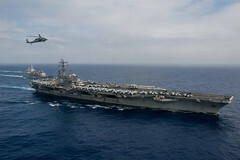 Carrier Strike Group 5, which includes USS Ronald Reagan (CVN 76) and several guided-missile cruisers and destroyers, along with aircraft from Carrier Air Wing 5, is conducting routine operations in the South China Sea. 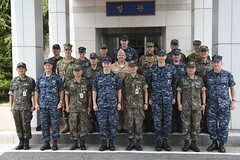 Senior leaders met at the Republic of Korea Fleet base in Busan to discuss continued cooperation efforts regarding anti-submarine warfare (ASW). 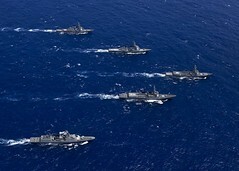 The John C. Stennis Strike Group arrived at Joint Base Pearl Harbor-Hickam June 28 and 29 to participate in exercise Rim of the Pacific. 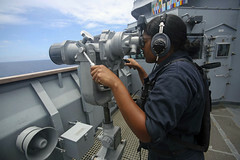 Commander, U.S. 3rd Fleet is wrapping up exercise Pacific Dragon, a trilateral BMD tracking event between the U.S. Navy, Japan Maritime Self-Defense Force and Republic of Korea Navy, held June 20-28 off Kauai, Hawaii. 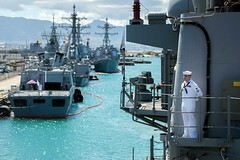 The guided-missile destroyer is scheduled to return home to Joint Base Pearl Harbor-Hickam June 28 following a five-month deployment to the Western Pacific.